We can already see the days getting longer, and that is a sure sign that we are on the downhill winter slope to spring. As you look out the window, is that old hedge looking really bad? Thin at the base? Full of gaps? Broken top from winter snow? So fat it takes up half your garden? If you answered, “Yes” to one or more of these questions, then it sounds like time to replace that hedge, and plan for a new one. Spring is the ideal time to do this, as the new plants will have plenty of time to establish over the summer, and they will be in great shape to pass easily through winter and really get moving the next year. With that in mind, let’s look at the important steps in moving from the idea to the reality of a new hedge. Let’s look at each of these steps and see what is involved. Mostly we want a hedge that is there all year. Sometimes a deciduous hedge is the right choice, but if privacy is an issue, remember that a deciduous hedge is anything but private for a large part of the year. Evergreen plants make a lot more sense. Although broad-leaf evergreens like laurel or holly make great, fast-growing hedges for shadier places, some kind of conifer is usually the best choice for sunny or partially-sunny locations. 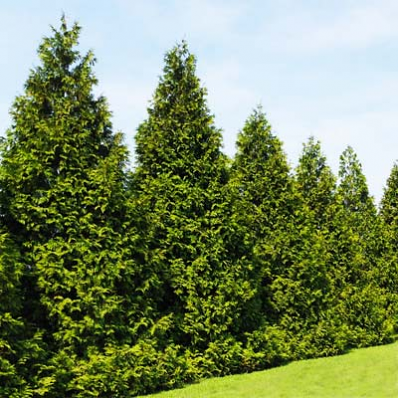 If you want a fast-growing hedge, then the top choices come down to just three; Emerald Green Arborvitae for cold areas; Italian Cypress for very hot, dry regions; and the king of them all, Thuja Green Giant, for everything in between. Hardy from zone 5 to zone 9, this is also the fastest-growing evergreen of all, so it’s the ‘go-to’ plant for almost everyone. There are two basic ways of planting a hedge. You can plant a single row, with the plants close together, or a double row, with the plants staggered, and more widely spaced. In a smaller garden a single row is best, because it won’t take up so much room, but in a bigger space a double row will give you the densest and sturdiest hedge, without needing a lot more plants, since the spacing is wider. For Thuja Green Giant, use a single row spacing of 3 feet. You can go a little wider, up to 5 feet, but of course it will take longer to fill in. Don’t make the mistake of going closer than 3 feet, as there must be enough room for each plant to develop properly. For a double row, space the rows 3 feet apart, and the plants 5 feet apart in the rows. Again, you can go to 8 feet, but it will be longer before you have a uniform hedge. For Emerald Green Arborvitae, use a 2 to 3 foot spacing, or a 3 to 4 foot spacing in a double row, allowing 2 feet between the rows. For Italian Cypress use the same spacing, because although this tree grows taller, it has a narrow profile, and spaced too far apart it will never fill in. To calculate how many plants to order, measure the distance carefully, and then divide it by the spacing you are planning to use. Clearly for a double row you will multiply that number by two. Add a couple of extras at least, in case your measuring is a bit off. For this job it is best to hire someone with a chain-saw and a back-hoe. If you are happy using a chain saw, you can do all the cutting down – wear a hard-hat – and have a contractor come in and remove the wood and stumps. Have the back-hoe dig over the area for you, going deep, as this will make preparing the area a whole lot easier. Before anyone starts digging, it is vital to have the area checked for services. The last thing you want it to rip up your water mains, sewer pipes, or underground cable or electricity services! That old hedge will have taken a lot of nutrients from the soil, so replace them, and restore the quality of the soil itself, by digging in plenty of rich organic material. Garden compost; rotten cow, sheep or horse manure; mushroom compost; or even rotted leaves, are all good materials. Spread a layer at least 2 inches deep over an area at least 3 feet wide, where your new hedge is going. Add a good sprinkling of superphosphate or bone-meal, or a hedge ‘starter fertilizer’. Use a rototiller to mix everything together and then rake the area level, firming it down with your feet as you go. If you can do this at least a couple of weeks before planting, that is best, as the ground will have some time to settle. The night before planting, water the containers with your new plants thoroughly. Next day, space them out carefully along the row, using a taut string to keep the row straight. Make sure each plant is exactly the same distance apart, or your hedge could have gaps in it. Use a stick across the planting hole to get each plant at the level it was in the container. Have a hosepipe handy, and as you put each plant into its hole, fill the hole with water and let it drain down before adding the last of the soil. This method gets water right down to the roots, where it is needed, instead of watering just the top. Once you have taken a day or two to admire all your work – and to recover – don’t neglect your new plants. Give them a deep soaking at least once a week, and twice a week if the weather is hot. A soak with a water-soluble hedge food once a month is a terrific way to really get your hedge off to a flying start. As soon as you see some new growth, start trimming just a little bit from your hedge. Don’t wait to trim until it reaches the final size you want. For the best hedge you need to develop a dense structure from an early age, by regular light trimming. You only need to take an inch or two off, but this is the secret of a superb hedge. Once it is forming nicely, keep the upper part narrower than the lower part, so that the bottom stays dense and green right to the ground. After all that work you deserve a beer – or at least a Coke! Within a very short time your new hedge will be looking great, the hard work will be forgotten, and your new hedge is set for the next few decades at least. Job well done. Winters can be long or short, depending on where you live. Your local climate may be continuous sub-zero temperatures, and frequent snow, or it may be mild, with occasional storms, separated by warmer, sunny weather. Whatever the climate, it is probably that you don’t spend a lot of time in your garden in winter, certainly compared to summer. In your absence, issues can arise, so a good thing to do as the New Year gets underway is to go outside on a pleasant day to check things out. Here we will concentrate on hedges, but of course checking your other plants too is a good practice at the same time, or perhaps on another good outdoor day. Remember to dress warmly! If you live in a warmer, drier region, it can be extraordinary how dry the air can be, and how much water is lost by your plants. In a cold snap, already slightly desiccated plants can burn badly, so number one tip for winter health is to keep up the moisture levels in the soil. If there has been some recent rain the top inch may look damp, but lower down can be dry. Take a spade and dig a few small holes in the root-zone of your evergreen hedges, such as Thuja Green Giant. Go down about six inches and pick up some soil. If it feels dry, and is crumbly, its time to soak your hedge. If this is the first winter since planting, it is best to assume that most of the roots are still inside the root-ball as it came out of the pot. If you live in a drier region, it is a safe bet that those small root-balls will be dry. Take a hose with a gentle spray nozzle, and give each plant a generous soaking. The ideal is to let the hose trickle for 10 minutes on each root-ball, one by one along the hedge. With an older hedge, especially if you live in a warm place, you probably already have some form of irrigation in place for your hedge. If not, then a simple trickle hose of the ‘leaky pipe’ variety, run along the length of the hedge will do an excellent job of giving a deep soaking. Let it run for several hours, until a wide band of soil looks darkly colored by the water. Remember to disconnect the hose from the tap and let it drain. A sudden drop below freezing could split the pipe if you don’t. If you have been having strong winds, snow storms, freezing rain – or all three – then there is a risk that some of your hedge has been damaged. Better to find out now, as damaged parts can encourage further damage if left unattended. If any branches have broken, cut them off neatly below any areas of torn bark. Try to cut back to a green, growing branch, as most hedge evergreens cannot sprout from bare wood. Yew trees are an important exception to this rule. If you are left with a bare stump, better to cut the limb out completely, as no matter how hard you wish it, that branch is not going to sprout again! If you notice a heavy build-up of snow or ice on top of your hedge, take a rake and knock off as much as you can. Try not to tear at the branches, but give the snow a good whack – it will shatter and fall away. If you do have this build-up, perhaps the top of your hedge is not being trimmed in a suitable way. In areas with heavy snow, go for a narrow, rounded top, as this shape will shed snow much better than a flat top. 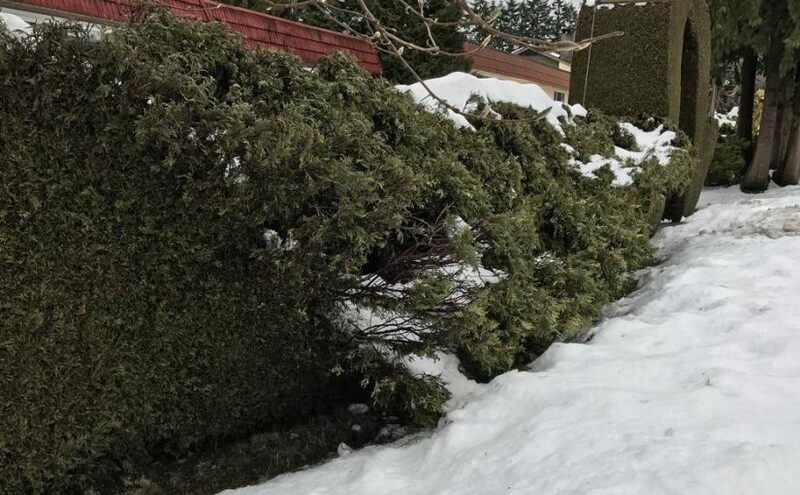 Snow is heavy, and the weight of it can easily break a hedge – it’s the most common cause of hedge damage in cold, snowy areas, such as around the Great Lakes. Trim a few small pieces from your hedge. Take them into a warm place to thaw. Are they crisp and dry, or even crumbly? If there are, then your plants may be suffering from ‘winter burn’, caused by the inability of your hedge to draw sufficient water from the frozen roots. As moisture is lost in cold, drying winter winds, the foliage gradually dries out and dies. If you do see this problem, it’s not too late to take preventive measures. Newly planted hedges, and indeed all evergreens in cold climates, are especially vulnerable, since they don’t have a deep, extensive root system to find moisture below the frozen soil. Wait for a dry day above freezing, and spray the hedge with an anti-desiccant. These treatments, which should be used more regularly, form a coating over the leaves and trap moisture. If you have already applied an anti-desiccant before winter, if a suitable day arrives, go outside and put on a fresh coating. It doesn’t last for a long time, especially if you have had a lot of rain since you applied it. Mulching the ground around your evergreens is another way to keep the soil from freezing hard, and that will protect your plants from winter burn. If you live along a highway or road, or if the hedge is along your own driveway, then look out if salt has been used to clear snow or ice. If the weather is above freezing, taking a hose and giving your hedge a thorough wash will remove any salt that has built up on the foliage. If you do have a risk from blowing salt from road clearing, a relatively simple solution is to suspend burlap from poles about a foot in front of the hedge. This will trap salty water and spray, so that it will not get through to the plants. Don’t make the common mistake of putting the burlap right up against the hedge – this simply traps the salty water against the foliage, making the problem worse, not better. These simple checks will help your hedge pass through winter unscathed. They are especially important if this is a newly-planted hedge. If you found problems, follow the suggestions for how to prevent them in your routine care, and with some simple activities in the late fall. Hedges are an investment, and they take time to develop properly. Why take risks that could destroy that work and money in a matter of minutes? As Benjamin Franklin said, ‘an ounce of prevention is worth a pound of cure’. Will Thuja Green Giant Grow in My Garden? This is a very common question from gardeners who have read about this fast-growing tree, and want to use it in their garden. It certainly makes a wonderful screen or hedge, as well as being perfect for big specimens to give presence and structure to your garden. This is a very reliable and adaptable plant, but it certainly pays to check if it is ideal for you. There are a few basic parameters of your garden to consider, and then you will know if you can join the millions of happy growers of today’s most popular evergreen. Across the cou ntry there are many different climate zones, usually based on the average winter low temperature. Remember that plants are not affected directly by wind-chill, although cold winds can damage them by desiccation. So ‘real feel’ temperatures are not important, just the actual temperature. The USDA zone system is the most widely used, and you can find out your zone just with your postcode. Thuja Green Giant is hardy all through zone 5, and anywhere warmer until we reach zone 10. If you are in zones 5 to 9, then you have reached first base. The next thing to consider is rainfall. 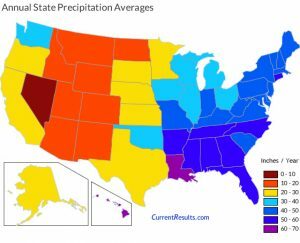 Take a look at this map, which shows annual average rainfall by state. Ignoring the states that are zones 3 or 4, if you live in a blue state, you can grow Thuja Green Giant very easily. After watering regularly while it becomes established, you will probably only need to water during extended dry periods in summer, which will not even be an annual event. If you have very sandy soil you may need more frequent water. If you live in a yellow state, you will need to water during most summers, and having a simple irrigation system, especially during the growing phase of your trees, will definitely be an asset. Only if you live in an orange state do you need to think about possible alternatives. For those areas, consider using Italian Cypress, or an upright type of Juniper, for a hedge, unless you are able to provide all-year irrigation. Because soil is the basis of all your gardening, no matter what you plant, you should always check your type of soil. Thuja Green Giant is very tolerant of many soil conditions, so it will grow in most gardens without problems. Even so, since this is vital information that will guide all your plant choices, check it out – it’s easy to do. Soils vary too much across small distances for their to be national maps to help us. There are three important aspects to soil and they are easy to determine. First is your soil texture. This is how fine or coarse the particles in your soil are, and it tells you if you have sandy soil, clay, or something else. No special tools are needed for this simple job. To begin, scoop up some soil from a few spots in your garden, and mix it together. Even in winter, if you can scrape back the snow and dig out a little soil, it will soon thaw when you bring it inside. Take a palmful of the mixed soil, and place it in your hand. Add a little water if needed, and mix until the soil no longer sticks to your fingers, but forms a ball. Squeeze and push the ball of soil out of your palm over your first finger, using your thumb, until it forms a ribbon. Do this until the ribbon breaks under its own weight. If the ribbon is half-an-inch long or less, you have a Sandy Soil. If it is an inch long before it breaks, then you have a Loam Soil. A ribbon that holds together for one and two inches tells you that you have a Clay Loam Soil. If the ribbon is longer than two inches, you have a Clay Soil. Whatever the soil you have, stroke the ball with your thumb. If it feels gritty, no matter how long a ribbon you were able to make, then you have a sandier version of these three types of soil, perhaps a sandy loam, or a sandy clay. These soils will drain well, which is important, but they will probably also need more frequent watering. The smoother the ball feels, the more clay there is in it. Thuja Green Giant is very adaptable and will grow well in most types of soil. In sandy soils add lots or organic material when planting, and water more frequently, especially during dry weather. You will probably also need to use a granular or liquid fertilizer to get the maximum growth from your plants. Clay soil is also improved by adding organic material, since it creates open spaces in the soil and so increases the natural drainage. Don’t water clay soil if it seems damp, as it needs those drier periods to draw air into the ground. This is necessary for the development of a healthy root system. The second important thing to know about your soil is the balance between acid and alkali. This is called the ‘pH’, pronounced as two separate letters. To test this, pick up an inexpensive kit or probe from your local garden center or hardware store. Acid soils have a pH number less than 7, and alkaline ones have a number above 7. A value of 6.5 is the best number to have for most plants. Unlike many other evergreen trees, Thuja Green Giant does well even in very alkaline soils, with pH values over 7.5 That makes it a valuable plant for areas like that, which can be hard on many other plants. The last bit of useful information you need is the speed at which your soil drains. This is also easy to check. Dig a hole a foot in each direction, and a foot deep. Fill the hole with water, and time how long it takes for it to empty. If it takes less than 10 minutes, you have very fast-draining soil. You should add lots of organic material to help it retain water, and mulch regularly as well. If it takes between 10 and 30 minutes to drain, you have the perfect ‘well-drained soil that so many plants – including Thuja Green Giant – just love to grow in. If it takes an hour or more to drain, then you have slow-drainage, and you should plant your new hedge or screen on a raised mound of soil, digging it up from the sides to raise the planting area at least 6 inches above the surrounding ground. 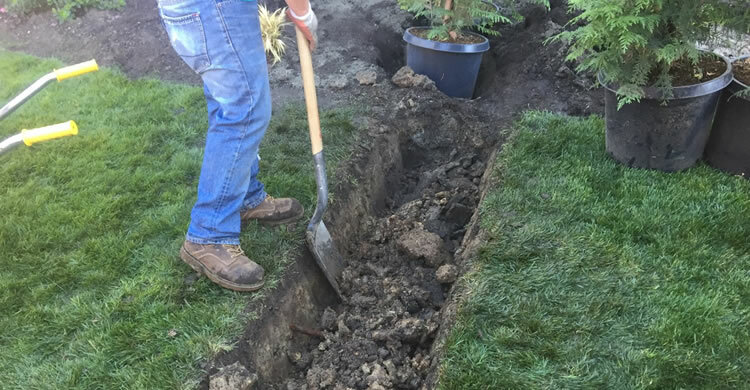 If you are putting in a new garden, or developing an old one, you might want to install drainage tile across the property, especially if it takes 3 or 4 hours for that hole to drain. In constantly-wet soil, you should consider a plant like Bald Cypress, or Willow, for a hedge, as these plants thrive in wet conditions that defeat other plants. Once you have all this information, you can easily decide if Thuja Green Giant is the plant for you. If there are issues, then a lot of them can be fixed with good soil preparation before planting. Don’t forget to also check that you have enough room for what will become a large plant, especially if you don’t trim it. Good luck with your planting plans – knowledge is power! Do I Need to Trim Thuja Green Giant? Thuja Green Giant is a plant for everyone, and that includes those who don’t like gardening. Many people are willing to prepare the soil, and plant, but after that they just want their plants to take care of themselves, while they turn their attention to other important matters, like family, or golf. If this sounds like you, and you have been considering using Thuja Green Giant for a screening plant, to hide that ugly view and enclose your garden. Maybe you are not sure, because you see so many examples of this plant used for hedges, where the owners trim once, twice, or even more often each year. You don’t want to do that, so how do you decide if it will work, and what are the limitations of not trimming? Do You Have the Necessary Space? Because we see this plant trimmed into hedges so often, we can be forgiven for not realizing it is a potentially large plant. Since it is fast growing, it will reach full size in a relatively short time. You can expect a minimum height of ten feet from small plants in no more than 7 years. If you start with plants in the 4 to 5-foot range – a good starting size – then in 7 years they will be 15 feet tall. The original plant, which was grown at the National Arboretum in Washington, was over 30 feet tall just 25 years after being planted as a tiny plant a few inches tall. That 30 feet is usually given as the maximum height, but all evergreens grow just as long as they are alive. They grow more slowly, but you can expect your plants to eventually exceed even 30 feet. If you aren’t going to trim, ask yourself if a screen that tall is too much. Remember that it will throw a long shadow for most of the year, apart from the few months of summer, when the sun is high in the sky. If you plant it to the south of your garden, it will give you a lot of shade – maybe you want that. If you plant it to the north, next to a neighbor, then they may not want your shade on their garden. How Wide Will Thuja Green Giant Grow? Consider too that a single plant can become 12 feet wide when mature, so a screen of untrimmed trees will be 12 feet thick. The best advice is to plant your screening row of trees 6 feet inside your property line, unless your neighbor(s) agree that you can plant it closer. That way the trees are always on your property, and there is no danger of disputes. Check too with your city. If you are in town, it is possible that there are height limitations of hedges and screens, and if so you should choose a shorter plant for an un-trimmed screen. Considering this width, it makes sense to plant your trees 6 to 8 feet apart, so that you will have a solid screen in a few years. If you are planting a specimen, then give it a space at least 15 feet across, so that you can enjoy its mature appearance without it looking crowded. Don’t plant in front of windows. If you have 8 to 10-foot ceilings, then the windows on a third floor will be blocked in time. Don’t plant too close beside a door. You should place the trees 6 feet or more away from the edge of the door opening. Rely on your measurements, even if you think it looks too far away – remember they grow fast! Some people plant ‘by eye’, but unless you are experienced with outside distances, you will probably judge it wrongly, and end up having to trim after all. Careful measurement is much more important when your goal is to not trim your trees. You may have plenty of room, but getting the position just right is the key to avoiding trimming – make a mistake and don’t allow enough room and you will be up that ladder with the hedge trimmers very soon. Are There Any Risks to Consider? If you live in an area where fire is a risk, that is something else to consider. If your trees catch fire, you don’t want them to spread that fire to other trees, or even worse, to your home. In fire-prone areas it is best to plant all taller trees so that their outer edges are at least 30 feet from your home, or outbuildings. If you have a sloping garden, then on the downward slope allow 100 feet, as flames will burn uphill more rapidly. Again, go out and actually measure the distances – don’t risk your property for a few minutes work. If you have thought about all this, and you see no problems fitting plants of this size into your garden, then go ahead. Now you have planted them, after careful measurement and placement, just sit back. Thuja Green Giant grows into a beautiful, dense, upright tree, of charm and character. It is resistant to salt spray, rarely nibbled by deer, and sturdy enough not to be blown down in regular storms, either rain or snow. Even if the branches do get weighed down with ice or snow, when it melts they will spring back up, and the form will be restored. Remember that an unclipped screen will be more ‘natural’ looking. It will have a looser, informal look, and the top will not be perfectly flat and even. It will look great, it just won’t be a formal hedge. Many people think it is more beautiful when allowed to grow naturally, and whether you plant it as a screen, or as an individual specimen in a lawn, this is the perfect tree for that natural look. Maybe Just a Little Trimming. . . There is a good argument to make for doing some trimming while your trees are growing. If you do it right, it does not commit you to a life behind a hedge trimmer, but it will give you better looking plants for life. When a fast-growing plant like Thuja Green Giant is young, it is common for several shoots to compete and give several tall growing points on your trees. Each one will develop into a ‘mini-tree’, and give a more open, wider plant. You can easily produce a more tapered, narrower tree with a little formative trimming. Here is what to do. Select a tall shoot in the center of the tree and leave it untrimmed. Cut back the tops of all the other shoots so that the tall one is at least 3 feet above the others. On a taller tree, make that 6 feet. As you move towards the outside, cut the stems shorter. Always cut back to an inward-facing shoot if you can, as that will keep the form tighter. You can repeat this process once or twice more as the tree grows. The result will be a lovely, flame-shaped tree with lots of elegance, for almost no work. Never cut back so hard that you leave a bare, leafless branch. It will not re-sprout, and you will have spoiled your tree. In fact, that last point is the main reason why you need to consider carefully before letting your trees grow untrimmed. Once they are tall, it is hard to make them shorter again, because you can only trim back to areas of green growth. It is easy to grow Thuja Green Giant untrimmed. It just takes a little foresight and planning. Looking ahead is always fun, and if you are planning to put in a new hedge in 2018, what are likely to be the most popular plants, and why? Looking back can be a guide to the future, so what plants sold well, and performed well, in the last few years? The top hedging plants continue to be, depending on where you live, Thuja Green Giant, Emerald Green Arborvitae, Leyland Cypress, American Holly and Italian Cypress. 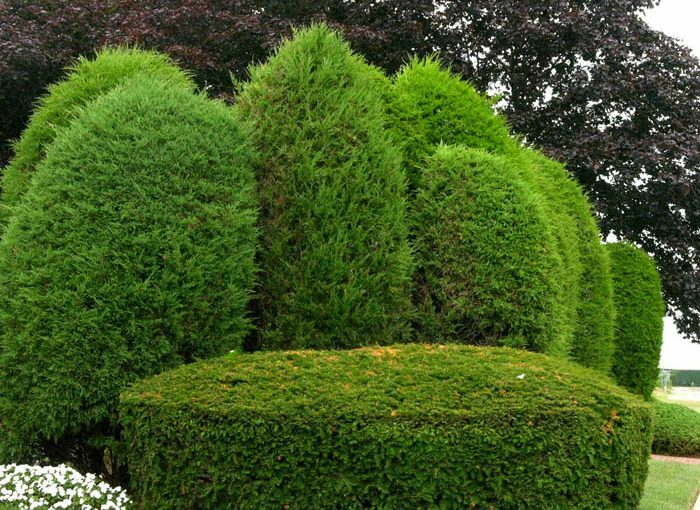 You can see hedges made from many, many other evergreens, both conifers and broadleaf trees, as well as from deciduous trees, with Boxwood being very popular for short hedges. But these are the top five plants, and so let’s take a look at each one, and see if it is a good choice for that new hedge you are planning for the New Year. This plant, a selected form of Eastern White Cedar (Thuja occidentalis), is by far the biggest seller and top choice in the coldest parts of the country. This dense evergreen is hardy to minus 50 degrees, so wherever you live, it can’t be too cold for this reliable plant. Not as fast growing as some others, it will still put on a couple of feet a year when young, and mature into a lovely, dense hedge that could be 12 feet tall if you need that much height. Because you are probably living in a snowy area if you choose this tree, make sure you taper the sides and round the top – keep it narrow to prevent your hedge collapsing under the weight of snow or freezing rain. Proven by science to be the fastest evergreen available, this tree, since its introduction around 2000, but known since the 1930’s, has been a real winner. It is a hybrid, and so very vigorous and capable of growing 3 to 4 feet a year. With that growth rate you will have a sturdy, tall hedge in just a few years. It is hardy right through zone 5 and warmer. If you live in most parts of the country, as long as you have moderate rainfall, and don’t get any colder than minus 20, you cannot pass by this plant easily. No wonder it’s the fastest seller in most garden centers. One great advantage over Emerald Green Arborvitae is how green it remains all winter. No bronzing or browning, so your hedges will always look perfect in winter – exactly when we notice them most. Choose it for any hedge over 8 feet tall. Although it is fast-growing, it will slow with maturity, so if you trim just once or twice a year it will always look great. This hybrid tree has been a reliable standby for half-a-century or more. Not quite as fast-growing as Thuja Green Giant, it is still capable of very rapid growth, especially if fed and watered well. It definitely grows best in moderate climates – not too hot and not too cold, and although fairly drought resistant it will do best with a good supply of water. In hot, humid areas it tends to suffer from disease, but in temperate climates it will do well. One area where they are especially valuable is on the coast. One of the parents is the Monterey Cypress, which grows hanging out over the Pacific Ocean. So if you need a hedge or screen at the coast, look no further than this reliable evergreen for salt resistance. Remember that Leyland Cypress will grow very large. This makes it excellent for tall barriers, to block out noise or salt-spray. Don’t plant in restricted spaces – a 40 to 60-foot tree that can be 25 feet across has no place in a small yard. Because it has sometimes been planted in unsuitable places, causing problems for neighbors as well as home-owners themselves, this plant has got a reputation as a ‘bad boy’. Don’t be put off if you have plenty of room and need a big screen, this tough, reliable tree is a top choice. Not everyone has a bright, well-drained sunny garden. Shade from trees, and low-lying areas are not top choices for planting most evergreens. If you need a sturdy hedge, but your soil is often damp, and trees throw shade across the area, consider using the American Holly, or other holly varieties. This are broad-leaf evergreens, with glossy leaves of a rich, deep green. Many produce bright red berries in fall and winter as well, brightening the garden at a dark time. They clip well, and grow tough and dense. The spiny leaves will protect your garden from all kinds of intruders too, so you will be safe and snug behind a holly hedge. American Holly will grow a little more slowly, probably one or two feet a year, but it’s a great choice for any shady, damp areas. If you love the look – and who wouldn’t? – it is also reliable in sun and even in areas that have season drought, once established. So it’s a good all-round choice too. Everyone has seen those pictures of Italy or Provence, with dark, narrow green fingers pointing towards the blue sky. This is the Italian Cypress tree, an evergreen that thrives in zones 7 to 11. It is especially useful in the south-west, where the weather is hot and dry, like its Mediterranean home. Easily the most drought-resistant of all the evergreens, the Italian Cypress clips into a solid wall of rich dark-green you will love. The dark coloring gives a touch of real class, and is cool on the eyes when the sun is blazing down. By now you should have a much better picture of which evergreen will be an appropriate choice for your new hedge. Make sure you prepare the ground well, and give your new trees, whatever choice you make, regular water through their first growing season. Trim lightly right from the beginning, to build a sturdy, dense structure, and you are well on your way to a healthy hedge you can be proud of.